My solo show, “Don’t Worry, I Have a Map” opened this past week-end in the Soo Too Gallery of The Soo Visual Arts Center in Minneapolis. 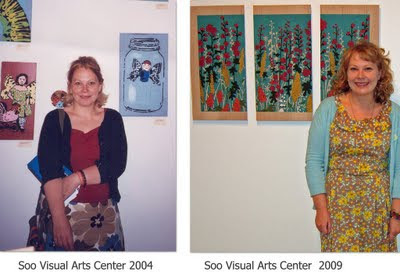 Here is a photo of me and my art from 2004 when I was a featured artist in the Soo VAC retail space which is now the Soo Too gallery where my show is up now, in 2009. It has been an exceptionally wonderful experience as an artist to have been able to maintain a working relationship with a gallery over these past five years, five years that have seen my work grow and mature. I am so thankful to Suzy Greenburg and all the staff and board members (now and in the past) for their ongoing encouragement and support. Thank You Soo Visual Arts Center!